Metal Casting History - 19th and 20th Centuries | Protocast Inc.
People choose Protocast Inc to be their Denver metal shop of choice because our company manufactures metal components in prototype and low-volume production quantities better than anyone else around — and we do it for an affordable rate. No matter if you have one part or 12,000 that need manufacturing, we offer the functional components, assemblies, and casting knowledge to bring you a viable solution within a reasonable timeframe. We understand that many of our customers are working with challenging delivery schedules, so they need to find a local foundry that can accommodate such requests. Protocast Inc. was founded with a cornerstone principle being that we work diligently to meet the unique needs of our individual customers. When you choose us, you get access to our team of engineers, who are able to provide consulting services at your request. If you are in need of a second opinion, the clean and efficient manufacturing we offer is only supplemented by our expert metal workers and engineers on staff. However, this is part two of a two-part series, as the title no doubt gave away. So instead of describing the intricacies of our casting processes and other services, we will be taking a trip back in time. In our previous post, we highlighted the early beginnings of metal casting, starting with the ancient gods of lore, from whom humans stole the power of fire, and, by extension, metalworking and casting. 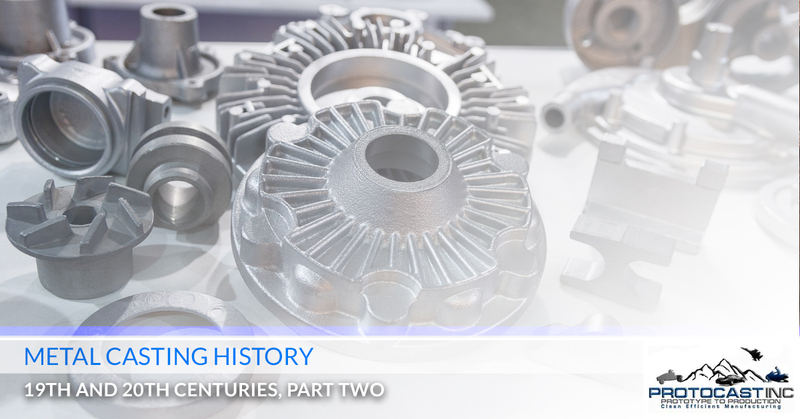 We eventually talked about the actual history of metal casting, starting with the oldest known cast still in existence, the copper frog, and ending with the (re)invention of producing cast crucible steel. All that to say, you should check out part one when you get a chance, even if your interest in casting is merely mild — you might just learn an interesting tidbit or two you could get a chance to share at your next dinner party! More seriously though, we find this stuff interesting, though we are slightly biased. Either way, keep reading if you want to learn more about the more recent history of metal casting, brought to you by your local Denver foundry, Protocast Inc.! 1809 – Centrifugal casting is established and introduced to the world by A.G. Eckhardt of England. Centrifugal casting, in case you were wondering, refers to a technique that is used to cast slender-walled cylinders with materials like concrete, glass, and metal. It’s also referred to as rotocasting. 1818 – At the Valley Forge Foundry, the nation’s original cast steel was produced using the crucible process. The crucible, also in case you were wondering, refers to a ceramic pot with refractory properties in which the metal in question can be melted and made ready for casting. 1837 – The first reliable molding machine is commercially distributed and available for public purchase by the S. Jarvis Adams Company, based in Pittsburgh. 1863 – Henry Sarby develops the first process that affords the capacity to be able to physically examine the surface for high-quality analysis. This metallography allows the etching, polishing, and detailed analysis of metal surfaces. Investment casting, a process which was previously lost to antiquity, is rediscovered by BF. Philbrook, a native of Iowa. 1913 – Stainless steel is melted for the first time by Harry Brearley in England. 1923 – In Zurich, Switzerland, the International Committee of Foundry Technical Associations was, well…founded. We aren’t sure why Switzerland is always the country where international committees are made and treaties are signed, but the Swiss seem like decent folk, so we are okay with it. 1940 – Wood flour is added to common foundry practice to be used as a sand additive. 1960s – The very first Disamatic molding machine is developed and introduced to the world. 1971 – Japanese inventors introduce a method known as V-Process molding, which involves the utilization of a vacuum and unbonded sand. 1976 – Compacted graphite iron, known as CGI, is developed in the United Kingdom. Remarkably, it has qualities of both ductile and gray iron. 1997 – Argonne and Inland Steel Corporation develops electromagnetic casting processes, which reduces cost and energy consumption while producing steel. As owners of a metal shop ourselves, we can affirm that those two by-products are very, very good things. From manually-operated bellows, clay pots, and copper to electromagnetic casting and beyond, we’ve covered quite a bit of ground in this two-part series. But if there would be one fact that we’d prefer you to remember about either of these posts, it would be that Protocast Inc. is your Denver foundry of choice. We provide a wide range of metal casting processes, with specializations in aluminum, magnesium, and zinc casting. We have experience working with clients who hail from an array of industries as well, so don’t hesitate to reach out to us to see if we can help make sure your next manufacturing project is a successful one. Contact us today!